When Westerners think of the Middle East and North Africa (MENA) conflicts they immediately reference the religious conflict between Sunni and Shia Muslims. It is true that most of the MENA region is split between Sunni and Shia, but often, these splits are more for the purpose of power than religion. Many Sunni nations share close economic relationships with Shia nations and other religions. Thus, in this case, it could be said that economics trumps religion under religious theocratic MENA governments. Qatar (Sunni dominated), although not outwardly open, has a friendly relationship with Iran (Shia dominated) as they both share oil & gas production from the largest gas field in the world: the North Dome/South Pars field. Egypt and Turkey (both Sunni dominated) have warmed to both Iran (Shia dominated) and Israel (Jewish dominated) as they will rely on future oil & gas supplies from both regions. A country that has openly embraced unity between both Shia and Sunni Muslims and the progression of the MENA region through economic and social cooperation has been Oman. The Sultanate of Oman (“Oman”) is a political monarchy, led by 75-year old Sultan Qaboos bin Said, and the only country dominated by a very different type of Muslim: the Ibadi Muslim. Sunni and Shia Muslims are both minorities in Oman and the Ibadi Muslim population makes up the majority. Ibadi Muslims are the lesser known branch of Islam which make up 0.1% of total Muslims and are concentrated mainly in Oman. The Omani Ibadis are considered to be the more progressive Muslim nation relative to their neighbors. They do not believe that one religious leader should rule over all of the Muslim world, unlike the Shia Imamate and the Sunni Caliphate. Other differences are that Ibadi leadership can be male or female, religious authority can be questioned if not righteous, and the Qur’an is the created word of God and not the direct word of God as believed by both Shia and Sunni Islam. “We do not regard our Muslim opponents as idolaters, for they believe in the unity of God, the Book, and the Messenger. But they are ‘infidels-ingrate’. We hold it lawful to inherit from them, marry from them, and live among them. The faith of Islam unites them (with us).” – Ibn ‘Abd Rabbih, al-‘Iqd al-farid., I, 261: Mubarrad. Kamil., III, 1041. The inclusiveness and awareness of Sultan Qaboos bin Said and his regime was highlighted during the Arab Spring in 2011. Unlike the prolonged civil unrest and violent outcomes of the Arab Spring protests in Libya, Egypt, and neighboring Yemen, Oman, in keeping with civil society, dealt with protests in a more inclusive manner and with much less violence. The protests in Oman were not targeted at overthrowing the monarchy; Omanis knew they were fortunate to have such a progressive and benign monarch. The Omani protests focused on addressing youth unemployment, strengthening education in Oman, and providing social benefits to the people of Oman from the country’s oil wealth. Protests started in January 2011 and ended by May 2011 as Sultan Qaboos bin Said created a committee to address protestor concerns. This led to a woman, Dr. Madeeha Bint Ahmad Bin Nassir Al Shibaniyah, becoming Oman’s minister of education and other ministerial positions were reshuffled. Sultan Qaboos bin Said promised another 50,000 new jobs, unemployment benefits of $US 390 per month, and took persecution powers away from the police and into a separate power in the Public Prosecution Department. In 2013, Sultan Qaboos bin Said pardoned those protesters jailed in 2011 and re-instated positions lost to those participating in protests. By addressing the concerns of Omanis and including their viewpoints into shaping politics, the monarchy gave a voice to minority protestors. Similarly, the general ideals of tolerance and inclusion in Oman have given religious minorities freedom. This freedom is likely an important contributing factor as to why none of the minority Omani Sunnis have joined Deash’s genocide in northern Iraq and Syria, nor have they participated in al-Qaeda in the Arabian Peninsula (AQAP) in neighboring Yemen. In fact, Oman has been adamantly opposed to Saudi Arabia’s war in Yemen and Oman has taken a peaceful role in the Yemen conflict by providing aid to the Yemeni people and accepting Yemeni refugees. By no means is Oman the benchmark of women’s rights around the world, but relative to surrounding Middle Eastern countries Oman is as inclusive as they come. In the 1970s not a single woman participated in primary education, but as of 2007 the participation rate for women had increased to 50%. There are now more women than men enrolled in secondary education. 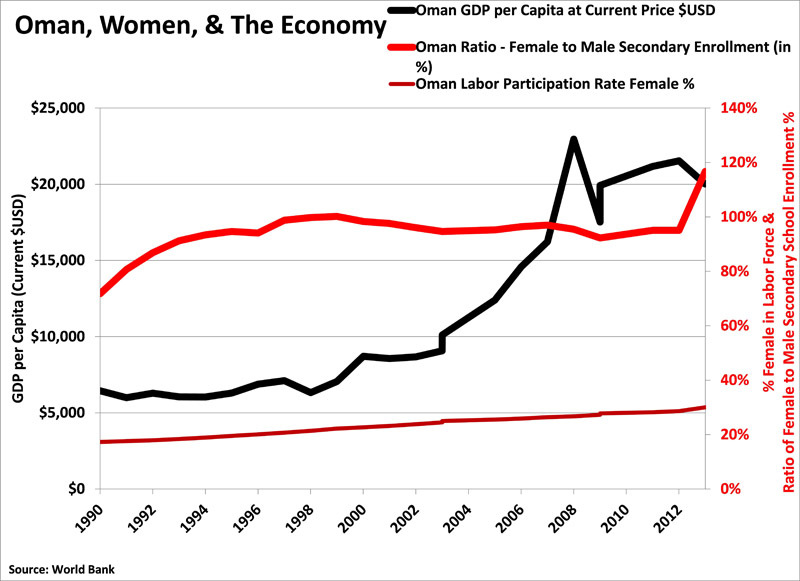 Since 2000 the female participation rate in Oman has almost doubled to 30% of the labor force – to put that into perspective – the US female participation rate in the labor force is 57%. Women are able to participate in government and universal suffrage was granted to all genders over the age of 21 as of 2003. These steps towards progress have all led to a more prosperous Omani economy. It is also important to mention some of the rights that women lack in Oman. Although Oman’s Basic Law prohibits discrimination by gender, Oman’s personal status law is ruled by Sharia Law as it relates to Muslim women. Men have the upper hand in personal status law which control inheritance, marriage, divorce, and child custody. Women must be granted permission by their husbands to obtain a passport; women may not transfer citizenship to non-citizen spouses; violent acts against female spouses or family members are met with less severe punishment; and female representation in the Omani courts is limited (of the 117 lawyers able to appeal to Omani high courts, only 2 are women). While Oman does not represent the western based ideal of civil society, relative to its surrounding neighbors, it represents an ideal foundation on which to build. Oman is still a monarchy ruled by Sultan Qaboos bin Said since 1970 with no real successor in place. Oman’s personal treatment of women, although progressive relative to Middle East neighbors, is in direct conflict of the United Nations Convention on the Elimination of All forms of Discrimination against Women (CEADW) because of the use of Sharia Law in the personal status law for Omani Muslim women. However, the inclusion and tolerance of the Omani people as a whole is a positive example of the opportunity that lies ahead for the Middle East if they can move past sectarian conflict between Sunni and Shia Muslims. Oman’s tolerance of ethnic and religious sects and continued foreign policy geared at bringing the Middle East together has provided the country with allies including Sunni-dominated Saudi Arabia, Shia-dominated Iran, and the United States. Oman’s ability to ally itself with a triangle of conflicting relations between the US, Iran, and Saudi Arabia makes it a vital point of neutral territory in the region. Being that Oman is an oil country with 84% of government revenue and 47% of GDP generated from oil, its strategic position on the tip of the Arabian Peninsula makes it an ideal global oil hub for European, Middle Eastern, and Asian markets. 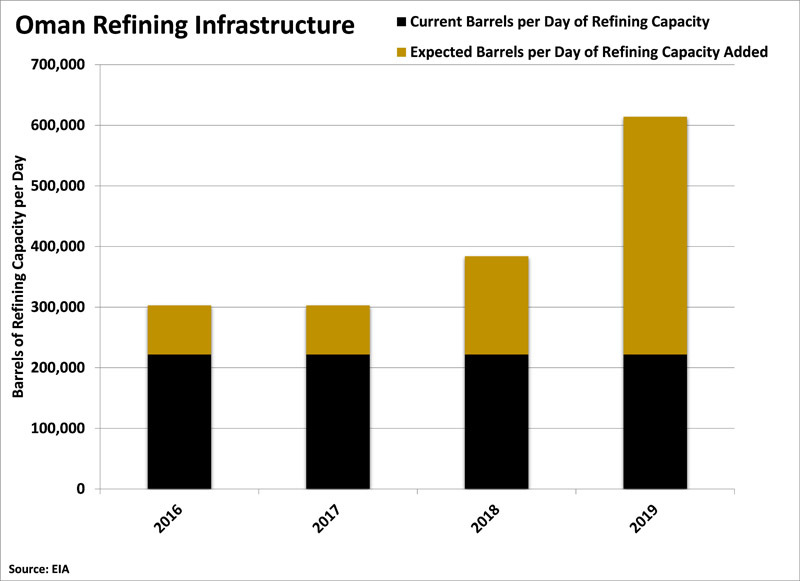 Oman plans on adding close to 400,000 barrels per day of oil refining capacity over the next 4 years and 200 million barrels of oil storage capacity just south of Ad Duqm along the Arabian Sea. All these investments and allied relationships have brought resilience to the backbone of the Omani economy: oil. 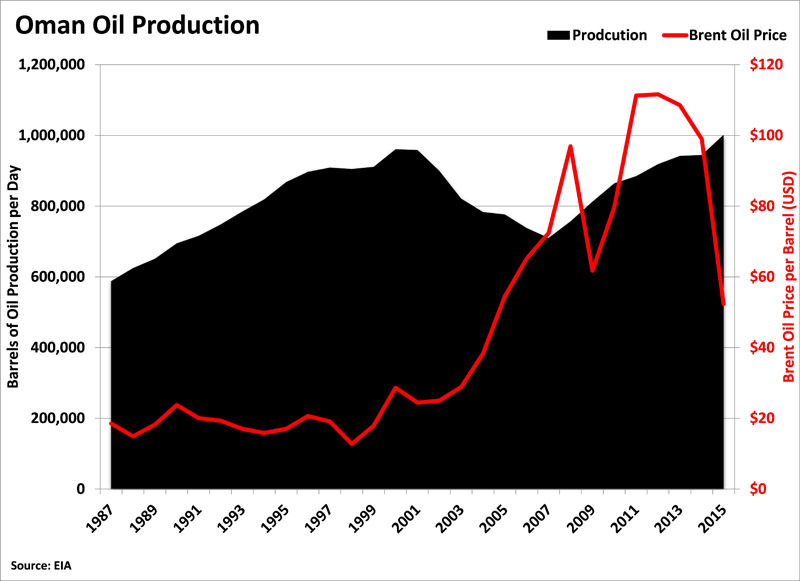 The maturing oil fields in Oman had faced declining production – with a lack of technology and investment – and the country opened up to the technological advancements of unconventional and enhanced oil extraction that was the catalyst of the US shale revolution. After Omani oil production collapsed 26% into 2007, enhanced oil recovery by some of the West’s most innovative oil & gas producers helped bring production back to all-time record levels. Additionally, Oman is now the second country in the MENA region to commercially produce oil using US-based horizontal drilling and hydraulic fracturing. Occidental Petroleum (OXY) is the largest independent producer in Oman using enhanced water and CO2 flooding. Since 2005, when OXY took operational control over the Mukhaizna field south of Haima, Oman, production at its operations increased 15 times. Other companies like Shell (RDS-A), Total (TOT), BP (BP), CNPC, Partex, KoGas, and Repsol all operate in Oman with similar waterflooding, CO2 flooding, and horizontally drilled hydraulic fracturing techniques. Occidental Petroleum has stated it will continue to build its Middle Eastern business around Oman and BP singed a $16 billion horizontal drilling and hydraulic fracturing contract on tight gas deposits onshore Oman over 15 years. Saudi Arabia has plans to build pipelines from southern Saudi Arabia to Ad Duqm, while Oman and Iran would like to contribute investments into the storage and refining segments in Oman. Oman’s ability to move in the direction of tolerance and equality both domestically and through foreign policy is reducing investment risk, building a platform for increased long-term economic growth, and, more importantly, brought people together as Omanis instead of Muslims living in Oman.